Debbie Rowe and Dr. Arnold Klein are officially mum. Rowe, Michael Jackson‘s ex-wife and mother to at least two of his children, has kept rather quiet given all the rumors and theories regarding both the paternity and maternity of the kids. She didn’t even comment yesterday when Jackson matriach Katherine received temporary custody over Prince Michael, Paris and Prince Michael II (aka Blanket) and sought to make it permanent. Apparently, she won’t be speaking up anytime soon. By saying Rowe will respond to “proceedings that were started by others,” the lawyers may be suggesting that she herself will not be filing a custodial motion. Klein, the King of Pop’s longtime dermatologist, also has remained reclusive since Us Weekly reported he may be the true father of the Jackson children. will be making one final visit to his beloved Neverland. The Santa Barbara Sheriff’s Department has just confirmed to E! News that plans are under way to hold a memorial service at the famed estate/amusement park in the hills outside Santa Barbara. “Our guys are meeting as we speak with the California Highway Patrol to discuss the security issues,” says Lt. Butch Arnoldi, a department spokesman. Sources close to the family say that there will be some kind of public memorial over the holiday weekend, perhaps with Jackson’s body lying in state. The body is expected to be transported from Los Angeles on Thursday. A public viewing will take place Friday and a private memorial service will be held on Sunday. 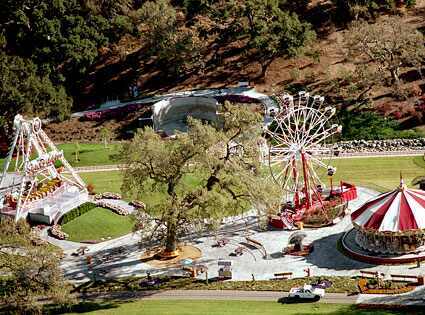 Jackson’s brothers Jackie, Jermaine and Tito visited the grounds over the weekend and earlier Tuesday a delivery truck was spotted dropping off boxes at Neverland.